The Wyeth clan continues to spark debate in the art world. To their fans, they are at the fore of 20th century American realism. 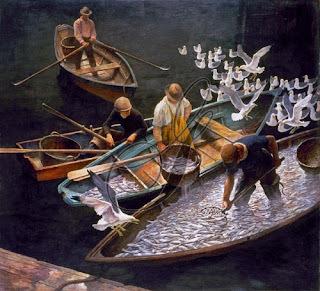 To critics, N.C. Wyeth (1882-1945) was little more than an imaginative book illustrator; his son Andrew (1917-2007) a superb draftsman, but lousy painter; and Andrew’s son, Jamie (1946-), an undistinguished dabbler derivative of father and grandfather. Of these charges, I am sympathetic only to the last–I have never been a fan of Jamie Wyeth’s work or his use of (to my eyes) garish coloring. I do, however, admire his sense of whimsy. 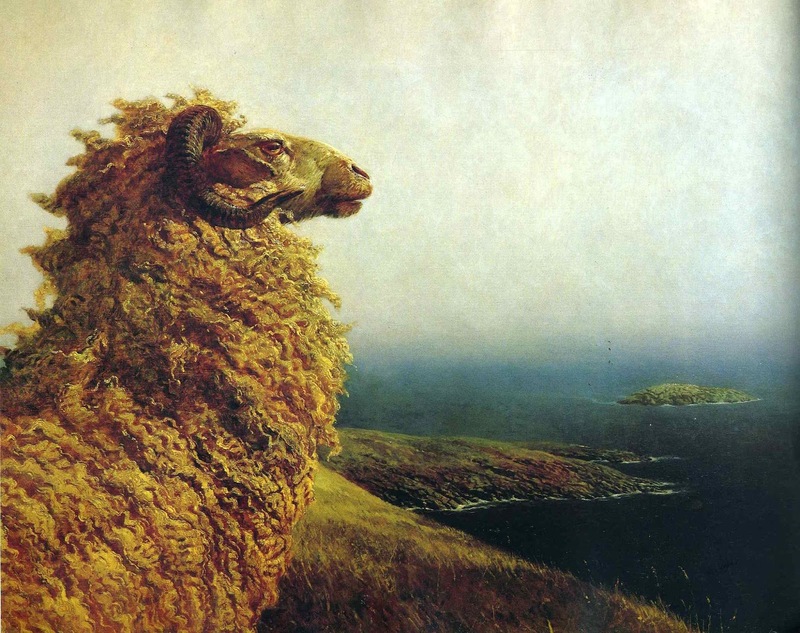 No matter what the critics say, though, the Wyeths have proved popular with the larger public. Kudos go to Vermont’s Shelburne Museum–a treasure in its own right–for mounting a show that’s not a Wyeth “greatest hits” overview. It’s titled Wyeth Vertigo and contains three dozen works chosen to put viewers off balance, either because of their dizzying perspectives, or because of unsettling of enigmatic themes. In addition to works from N.C., Andrew, and Jamie, there is also one canvas each from N.C.’s assistant, Peter Hurd, and his daughter, Carolyn. Just a few of the works are widely known, which adds to the allure for veteran museum-goers. Those familiar with the Shelburne Museum know instantly where the “vertigo” idea came from. 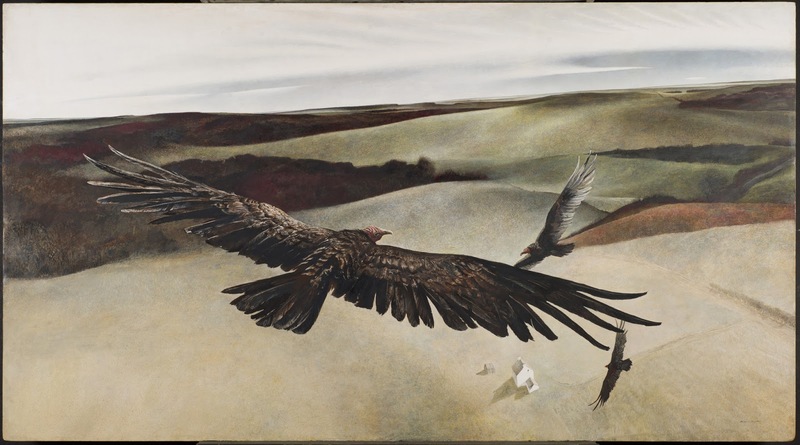 The museum owns a certifiable Andrew Wyeth masterpiece, Soaring. Andrew worked on it over an eight-year period (1942-50) and when you get see it, you understand why it took so long. First of all, it’s enormous (48” by 87”). Look closely. What you see is constructed of countless dry brush flecks, dots, and squiggles, almost none of which are longer than a fraction of an inch. Think a cross between pointillism and anticipation of dot matrix imagery. It certainly fits the myriad ways one can think of vertigo. Three enormous vultures circle so high above an isolated farm house that their wings dwarf the structure below. Are they hungrily anticipating feasting on a corpse? Is this commentary on the smallness of man in nature and his transitory existence? Or is it just a happenstance event painted from a unique perspective? There are several ambiguous canvases such as this. What are we to make of dead crows, eerie moonlight, or empty boats? One of the latter, by N. C. Wyeth, is rendered in (for him) rather lurid colors–pinks, purples, red undercoating–and depicts an intact boat just yards from shore. It’s title? The Drowning (1936). Mostly, though, the works on display just challenge us to look at things from skewed angles–from cliffs high above, at sea level, from a bird’s eye view, foreshortening…. We see, for instance, a windswept peninsula from a rocky hilltop as a goat might experience it in The Islander (1976), one of the few Jamie Wyeth paintings that grab me. A personal favorite was N.C.’s Dark Harbor Fishermen (1943), with its centered-weighted lighting, strong geometric shapes, and shimmery ovals (fish). He did several versions of this scene and this one dazzles. If you muse over it for a moment you realize that the “realist” painter has pulled a visual fast one. He wants you to believe that the night is so dark that the waters are pitch black and we cannot determine where it begins and the sky ends. The seagulls our eyes see as swimming and those we think are flying occupy the same plane. And if’s it’s that dark, where’s the light coming from that manages to spotlight just what we need to see? There’s not a torch or lantern in sight, nor is one reflecting upon a surface. How can we see the bow of the rowboat in the distance, but not the water upon which it floats? Now that’s vertigo for you–a magician’s illusion in which we never notice the manner in which we’ve been tricked!